Crooked teeth can significantly affect the beauty of your smile. A single crooked tooth makes your entire smile look instantly less attractive, especially if the affected tooth is in a very visible location in your mouth. As an adult, you may not think too much about straightening your teeth because it seems like dental braces are only for younger people. And of course, there is the issue of being embarrassed about having a mouth full of metal parts. But did you know that there are now options available for discreet teeth straightening? When you think of orthodontics, what most likely comes to mind are images of awkward-looking young patients with their teeth covered with metal wires and brackets – and you definitely do not want that look for yourself. Thankfully, technological breakthroughs have now made it possible for you to have a teeth straightening treatment without having a mouth full of metal parts. Invisible braces work by moving the teeth into better alignment in a discreet manner, so you can have the orthodontic treatment without embarrassment. 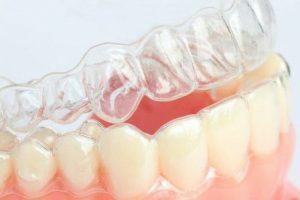 Adult orthodontics use clear plastic aligners that are barely visible, making it possible for you to have the teeth straightening treatment without the obvious metal parts inside your mouth. These aligners are used to move teeth into a straighter position, and can be removed easily for added convenience. Invisible braces are also more comfortable since they are made of a soft material-unlike metal braces that can painfully poke the soft tissues inside the mouth. Adult orthodontics can give you straighter teeth without the embarrassment and pain of metal braces.